Quo Vadis? : What an Idiot!!! 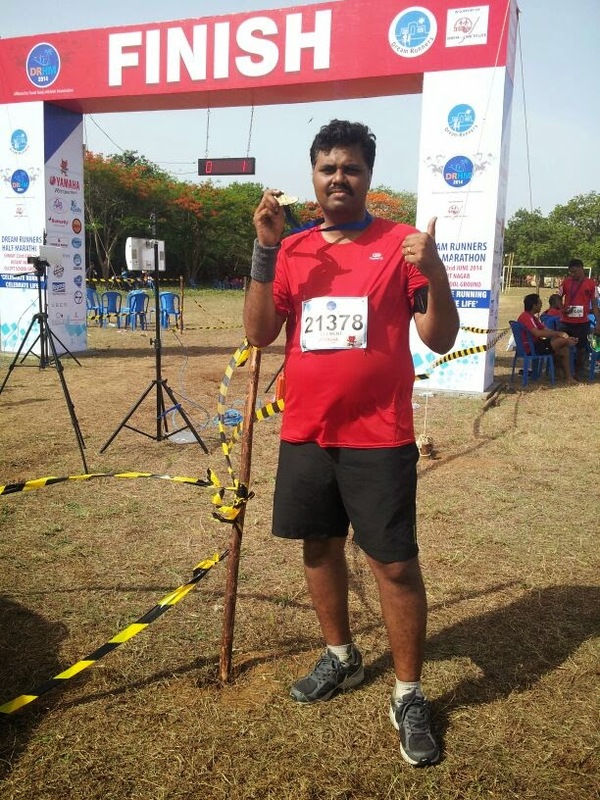 Simple as they may sound, for a beginner like me who had only done 17 kms as the highest distance in the three months and with no previous race experience this was a sizeable challenge. My excessive weight, weak knee, a history of a slipped disc were some of the deterrents from my running but having run for three months I wanted to challenge myself. Another minor detail was my dislike of running by the beach, in my limited experience the route by the beach tends to be more humid than the routes I am used to running regularly. However there was a bridge to be crossed and I decided to cross it the next day. The day dawned for me at 2.30 AM, I left home at 3.30 AM to pick up my running mates and reached the venue at 4 AM. If someone had told me a few months earlier that I would be doing these things I would have probably laughed him off but at 4.30 AM I joined 2000 odd runners warming up for the race. I met up with my pacer and informed that I wished to run with her. A pacer I had learnt a few days earlier is an experienced runner who will guide new runners to complete on a fixed time. So I found a pacer who promised to help me finish under 3 hours and I was reassured. The drone mounted aerial camera was a novelty and excited many of the runners and suddenly the race started. It was a procession initially and then the professionals made a clean break for it. The other runners started a procession that stretched for a long way. After bumping into many runners I made a break for it and opened up some gap before settling down to my steady pace. I am yet to develop speed and am happy running at a slow steady pace and I decided to stick to my plan irrespective of what others were doing around me. There were six aid stations (I think) on the route and the volunteers were really cool. Cut fruits, electrolyte drinks, water, pain sprays, water sprays, candies were all available and initially I was taken aback with all these but after some time the value of each of them hit me hard in the sapping humidity. I saw many “runners” walking, though it is possible that they were attempting the run-walk method to complete the race, since that method did not work for me I kept running. I noticed few of the runners pulling out or stopping for various reasons including the inevitable photo ops. I felt bad when I saw one runner who decided to turn around just a few hundred metres from the half way mark. Whether he wanted to cheat or just end his run I will never know. I did hear that some runners took shortcuts after crossing the mandatory timing junctions, but since this is essentially a race with oneself I do not know who cheated whom. I kept the pacer in my sight till about 9 kms when my inability to crank up speed made me fall behind but then I ran into an experienced runner from my group. He was originally running with another group of new comers however due to inadequate practice he had decided to just have an easy run. When this runner called MET saw me he decided to take it upon himself to pull me through the race and became the angel in disguise. With constant encouragement, running tips and guidance during the breaks in the aid stations he pulled me along till the 19th km when he told me that I was on course for a sub 3 hour finish. I was pleasantly surprised that despite my slow pace I had managed to make good time when disaster stuck. Exhaustion hit me hard and I felt dizzy, MET asked me to walk for some distance when I realized that even walking straight was a challenge. I completed the last stage walking slowly and all chances of a sub 3 finish faded away with every passing minute. The encouragement from all the volunteers along the way, one family that served water on the road to the runners, a band arranged by the organizers on a mini truck all kept me going. At the entrance to the school where the finish was one another runner said it is only 200 meters ahead and do not give up now. Maybe it was his words or the drum beats and the music I started running again and made a dash for the finish 19 minutes after 8 AM. At that moment I saw the delight on the face of my team mates who waited for me, the happiness of the leaser of our group who ran the few yards with me and MET who looked happy but a little disappointed with the timing. At that moment however nothing mattered except the feeling of completing the race. At that moment I understood the term “runners high”, I collected my medal and what happened after that is a blur to me. This I knew was a beginning. 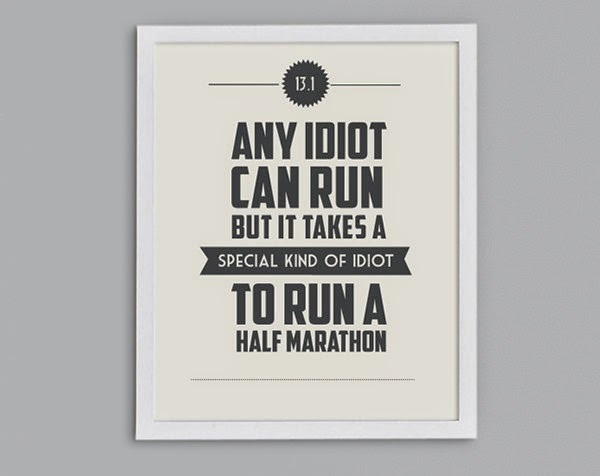 Any idiot can run a race, but it takes a special kind of Idiot to run a half marathon. Today I am proud to say I am that kind of idiot.